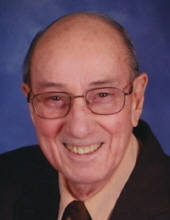 ALEXANDRIA, IN – Charles E. Cooper, 86, Alexandria, passed away on Tuesday, July 31, 2018 at his residence following an extended illness. Charles was born on July 21, 1932 in Dublin, Indiana to Clarence and Eva Marie (Carson) Cooper. He has lived in Alexandria for the past 70 years. He retired from Delco-Remy in Anderson in 1990 after 40.2 years of employment. He was a member of UAW-Local 662. A longtime member of the Alexandria Fraternal Order of Eagles-#1771 where he has served as Worthy Chaplain since 1983. Charles was named Father of the Year twice by the Indiana State Eagles. He was a member of the Alexandria First Christian Church where he served as the official bell ringer for several years. Services honoring Charles’ life and legacy will take place at 10 am on Saturday, August 4, 2018 in the Noffze Funeral Home, 501 North Harrison Street, Alexandria with Pastor Julia Bratton officiating. Interment will follow in the I.O.O.F. Cemetery in Alexandria. Friends may call at the funeral home on Friday from 5 pm to 8 pm. The Alexandria Eagles will conduct a Memorial Service at 7:30 pm Friday in the funeral home. Memorial contributions are suggested to the Eagles Heart Fund through the funeral home. To send flowers or a remembrance gift to the family of Charles E. Cooper, please visit our Tribute Store. The Alexandria Eagles will conduct a Memorial Services at 7:30 pm Firday at the funeral home. "Email Address" would like to share the life celebration of Charles E. Cooper. Click on the "link" to go to share a favorite memory or leave a condolence message for the family.